This is my initial offering of Lucky Cat designs. There will be more to come soon. 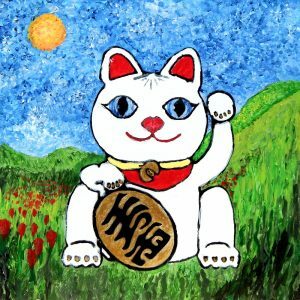 I chose Lucky Cats as my artistic subject for a few reasons. Asia is a big part of my past. My family has lived in and out of Asia for several generations and Asian art has always decorated the walls of our homes and was often expressed through the furniture that we sat on. The first place on earth that I remember is the Philippines and I went to Jr High at a Department of Defense School, in Sasebo Japan. The school was four stories high and overlooked the Sasebo River and downtown Sasebo. Sasebo was such a safe city that kids were allowed great freedom. I spent two years wandering the streets of Sasebo and absorbed it into my soul. It was the first time in my life I did adult type things. I ate in restaurants on my own, took taxis, went to my first R rated movie, and rode my bicycle endless miles through an exotic wonderland that overwhelmed the senses. The art and culture of Japan are part of who I am. I loved living there. I’ve only been able to go back once, since I lived there as a kid, and it was like coming home. That part of me, that is always missing, wasn’t missing for 30 days, because I was back in Japan. Lucky Cats are like a Japanese touch stone for me, so you could say that my focus of the Lucky Cat is like a love letter to Japan. Because a piece of my heart will always be there. 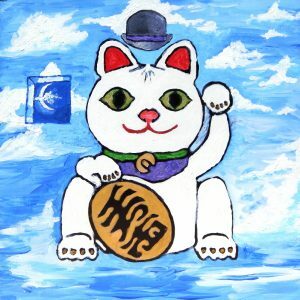 I wanted to create art that was positive and happy which made Lucky Cats a natural. 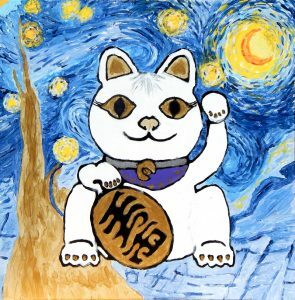 Creating and painting the Lucky Cat designs brings me great joy. I hope you enjoy them as much as I enjoyed creating them and that having them in your life brings you much Good Fortune.